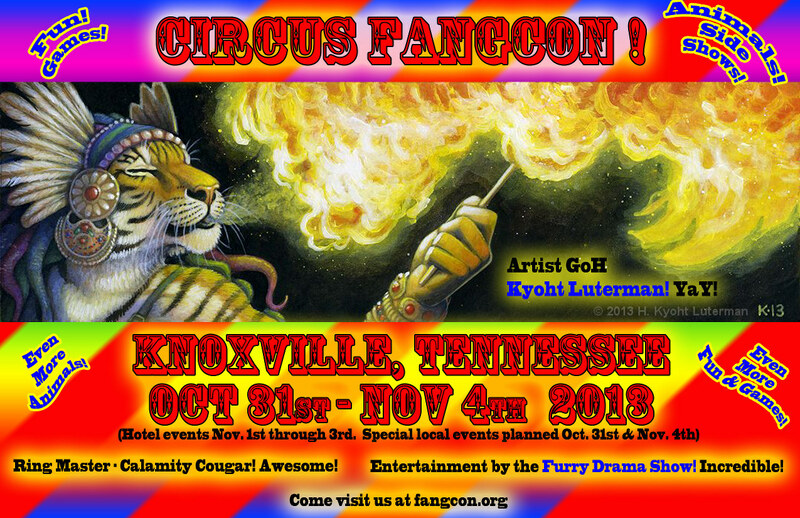 Playwright Jeff Goode's Fursona Non Grata is to appear at Fangcon on the weekend of November 7-9 in Knoxville, Tennessee. This play premièred at Wild Nights last year in the Central US, and also played on the West coast at Califur IX. The performance will be a radio play featuring many of the performers in their roles at Wild Nights. There will be some casting, as well as a rehearsal. This play is just one of the performances the convention will be offering. Fangcon's musical Guest of Honor is NIIC The Singing Dog, who is both a stage and studio performer. He will be presenting his newest album "Instinct". Another musician, Buck (or Husky in Denial) is debuting the album "Kay". These two are just the tip of the iceberg for entertainment. Rhubarb The Bear will be returning to Fangcon; and on stage for their first Eastern appearance is A Dozen Dead Furs - a metalcore band from Oklahoma. The following is The Wyrmkeep Entertainment Co.’s newsletter for July 2014. Items of interest include the announcement of the title for the Inherit the Earth: Quest for the Orb sequel, a new funding drive for that sequel and a new online reseller for Quest for the Orb. What The Fur has finally announced the dates and venue for their 2014 event. After some speculation about what was happening to the Canadian event, the release of information comes just before Christmas. The convention will be held in Montreal, Quebec from the 23rd to the 25th of May, 2014, and will be taking place at the Sheraton Montreal Airport. This promotional newsletter was provided by Fangcon. Story written by Nightwolf. Welcome one and all, to the furriest show on Earth! Come to a convention unlike any you've seen before! What makes Fangcon stand out from the rest? We've packed this weekend full of activities to enjoy all weekend long by all ages. Test your skill and luck at our carnival corner, with games provided by furries from all over Tennessee. Enjoy the fursuit parade and watch the suiters compete in the fursuit games. For a more refined feel, take a seat in the poker tournament. Relax in the hotel's heated pool before the late night dances. Welcome, Ladies and Gentlemen, Furries of all ages, you are invited to join us and our circus family for the second year of Fangcon, the greatest convention in Furry Fandom. Our convention circus circuit has us at a new location, the Holiday Inn in beautiful Knoxville, Tennessee! Start planning now and make those reservations for our Oct 31–Nov 4 long weekend. You need to get those front row seats now for the best viewing. You should also consider upgrading those memberships to our Sponsor and Super Sponsor levels. We will be adding perks as they come in and likely some secret ones too, to be given out at the con. The 2013 Furry Basketball Association Playoffs begin on Saturday, June 1, with a weekend of games between eight teams. Informal voting is underway to choose which games will be covered on FBA Courtside: LIVE!, a radio podcast featuring sports announcer T. Matt Latrans (Coyote) and friends bringing live coverage of FBA action. This newsletter also covers Wild Nights' guests of honor, charity auction, and details of meals, lodging, workshops and other activities. Come gather Knights and Knaves, Nobles and Lords, Ladies and laymen, as we once again gather for feasting and frolic. Wild Knights of the Round Table is pleased to announce that registration is now open! Visit the web page and sign in, then register online for the event. Join us as we celebrate our fifth year in Robbers Cave State Park, the last weekend of April, 25th–29th. Toronto-based furry convention Furnal Equinox has released its January 2013 newsletter. Preregistration remains open for the 2013 convention, though it will close on February 18. The convention has also released Meet the Fuzz, the first in a series of promotional videos profiling Furries in Uniform and featuring a selection of Toronto-area cast and crew. Toronto-based furry convention Furnal Equinox has released its December 2012 newsletter. Though early bird preregistration for the convention has now ended, registration remains open, starting at $40 Canadian. Applications are also open for the convention's inaugural Art Show, and staff are seeking panel facilitators. Kon'nichiwa, bonjour, hola, and hello from all of us here at Morphicon, as we plan to welcome you to our tiny slice of the world here in Columbus, Ohio. 2013 is quickly approaching us and in less than a year we wish to welcome you to a small con with a global reach. Morphicon plans to introduce you to furry cultures from all over our wonderful planet, so please join us and our Guests of Honor P.Moss and Ebony Leopard May 2–5 as we welcome you into our own little multicultural salad bowl; as long as some herbivores don't nom it first! Toronto-based furry convention Furnal Equinox has released its November 2012 newsletter. Early bird preregistration for the convention concludes in only a few days, on November 30. The RCFM flight normally scheduled for Memorial Day weekend has been postponed to a launch date window of June 14-16, 2013. In addition, the launch pad where RCFM can be found has also been relocated to Four Points by Sheraton Hotel. This is at the Huntsville Airport, so no need of a shuttle! All attendees will be entitled to "Free Parking" for this event. Animals escape zoos, migrate to Missouri this December! This release was provided by F3con staff, and has not been independently confirmed. There was a jailbreak of epic proportions at zoos worldwide last week. According to sources across the globe, numerous animals discovered a way out, and wasted no time making their escapes. "I was in the office keeping an eye on the enclosure cameras, and all I remember is seeing the antelopes, tigers, and otters just stand up on their hind legs and start walking, like they were born to do it. Well, before I fainted, anyway. When I woke up, all the cages were empty. ", said F. Uzi Lagik, of the Downtown Zoo. While there is no word on how exactly these creatures managed this incredible feat, there have been sightings of animals calmly walking the streets in many municipalities. Scientists are baffled with the peaceful and friendly behavior of even the most aggressive species since their escape. There have been no attacks, and even when approached, they exhibit friendly curiosity, waving, and happy noises. Reports are coming in from all over of even the most dangerous animals giving warm hugs to passersby. "It was so awesome! I got to hug a real dinosaur!" boasted Bonnie, 6yo, of Flufburg. Some individuals have even said they have heard the animals speak, but we all know that's the stuff of Saturday-morning cartoons. We're at the point where Further Confusion will start to come together very quickly. It's an exciting time for us, but also a busy time. This is some of what we will be working on for you! So with that in mind, lets get this party started! Toronto-based furry convention Furnal Equinox has released its October 2012 newsletter. Registration for the 2013 convention has begun, with a new Supersponsor tier on offer. Applications to the convention's Dealers Den and the inaugural Art Show are also open.